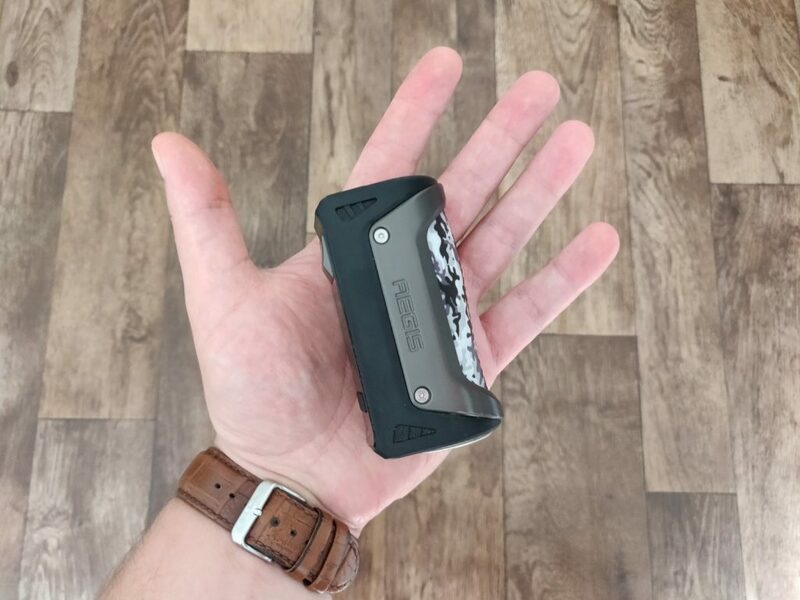 The GeekVape AEGIS is a mod that can rock two types of battery cells. It’s also built like a freakin’ tank. So… is it any good? GeekVape is well known. I’ve owned loads of its gear over the years, from RTAs to mods and RDAs. 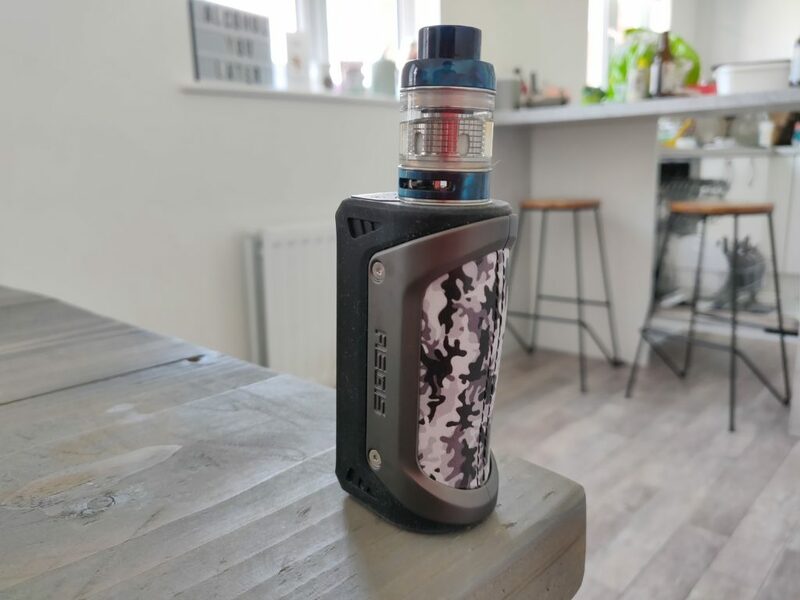 The GeekVape AEGIS feels like a step in a different direction, however. It looks and feels very, VERY premium. The mod itself is also water, dust AND shock resistant – and that’s basically all the bases covered. This means you can, technically, take it in the bath, drop it from a two story window, and lock it in a dust-filled room. And it’ll still work. These are three pretty hefty USPs for a vape mod, and as far I’m aware no other mod on the planet right now can claim to be able to do the same thing. Hell! Apple ONLY just made its iPhones waterproof! 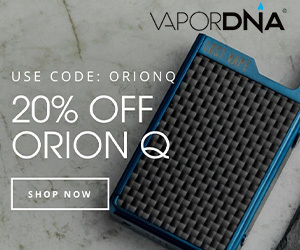 But in true GeekVape fashion, it is priced very reasonably. And this means that you, dear reader, are getting potentially A LOT of value for money. For me, this is the AEGIS’ main USP; the price is brilliant and you’re getting A LOT of value for money. But is it any good? I just spent a good couple of weeks getting to know this chunky mod. First things first: the GeekVape AEGIS is water-proof. That’s right. Just like most modern smartphones, the GeekVape AEGIS has full IP67 certification. And if that wasn’t enough it also has an 810G-516.6 shock proof certification (that’s the standard used by the military, by the way). Bottomline? This thing is basically the Superman of vape mods. Indestructible. Handsome. Robust. And reassuringly chunky. I also really like the way it’s designed; it feels great, ergonomically, despite being rather chunky and the machining is all very much on point. The fire key is beautifully placed, right above the display, and I LOVE the stitched, camo-leather accent on the side of the mod. To me, it looks and feels like an SX Mini mod. Only here, you’re paying around $100 less. 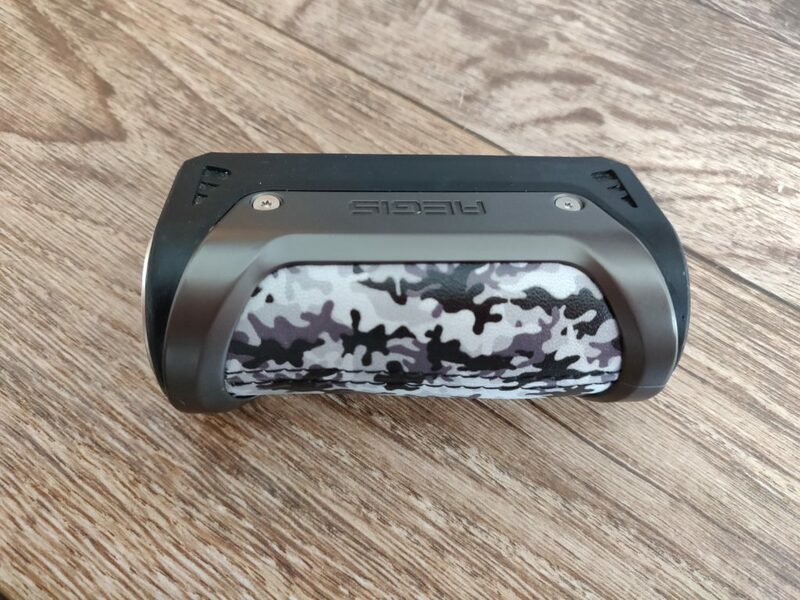 The chassis is made from a soft-touch silicon-like material combined with leather accents and a tough plastic, exoskeleton that circles the outer side of the mod. The only problem, as you can see in the images, is that it is a bit of a fluff-magnet! This makes it difficult to clean as well; the fluff just gets stuck and is tricky to get off once it’s on there. It’s not a deal breaker. Not by a long shot, but it is definitely worthy of note — especially if you’re a neat freak! Beyond this, the mod is near-flawless. I adore its industrial design, quality build materials, and the way it feels in the hand. The build quality, attention to detail, and industrial design are all top shelf. I REALLY like the way this mod looks. It’s easily as good as my Lost Vape DNA 75 mod in the looks and quality control department. Hell, even the battery opening is epic on this thing. I mean, it feels (and opens) like the vault on a safe. Once closed, nothing is rattling and nothing is escaping. Admittedly, it is kind of a pain to open and close. But it is secure. And this is what counts. 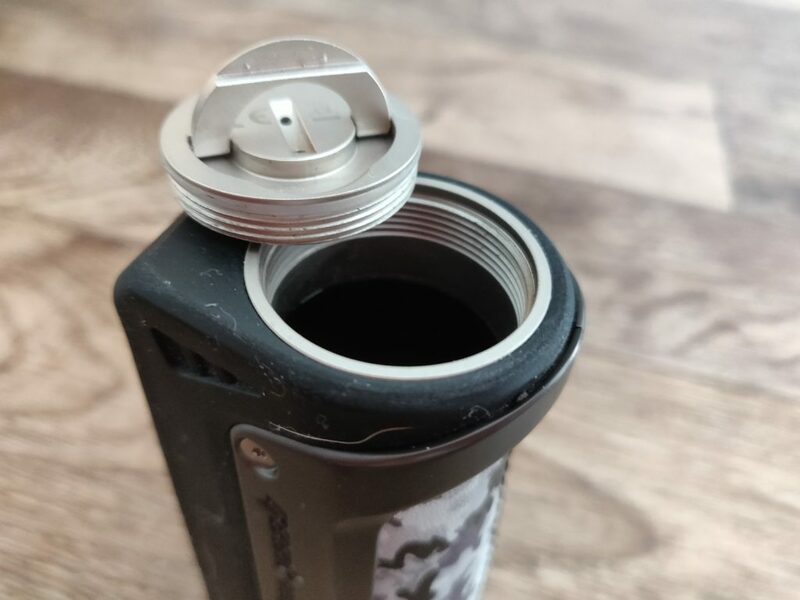 Because of the nature of its design, you know, all that water and dust proofing, GeekVape had to include a nifty venting system (just in case you have a battery failure). It’s hidden away, right next to the 510 pin, and it features a silicone plug that is designed to dissipate any gases that occur in the event of a battery failing (please note: this doesn’t happen often). You even get a couple of spare silicon plugs. Though you’ll need a screwdriver to get at the actual plug, as it’s hidden beneath a plate. Bottomline: A LOT of care and thought has gone into creating this mod. The longer I spent with it, the more this became obvious. Good work, GeekVape. You only get 100W of power with this vape mod. But that’s fine. You won’t need anymore. I never go above 100W these days. Even when I’m running a dual-coil RDA. And the reason for this is simple: I prefer longer battery life over a slightly bigger hit. 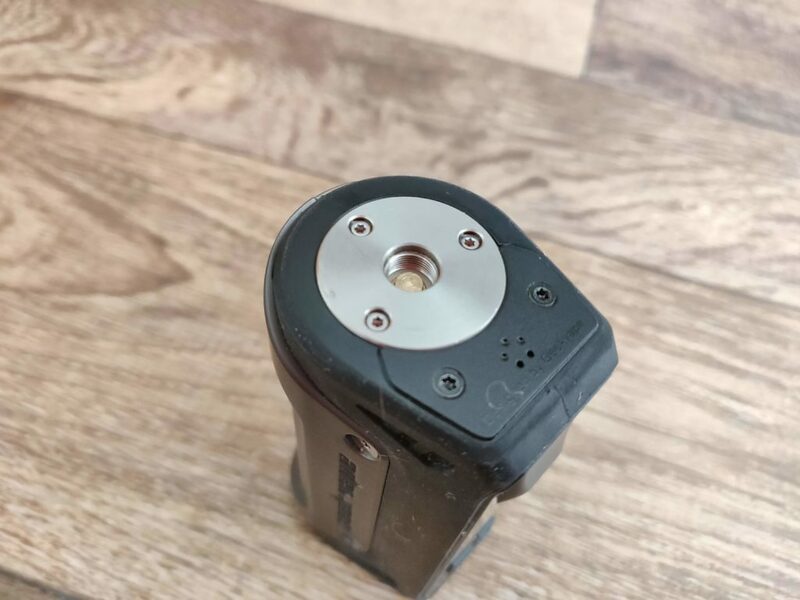 And because this mod is a single-cell setup, you’ll want to run it how it is designed to be run, and that means single-cell RTAs and/or lower power MTL tanks like the Kayfun V5. Do this and this mod will treat you like a KING. I’ve been running a single 26650 battery in my AEGIS with a Kayfun Prime on top. More on battery life in a bit though! This mod is a fairly solid performer. I’ve had no real issues with it, save for it occasionally turning itself. This could well be a safety feature I’m not aware of – but I don’t think it is. You only have 100W to play with here, and while that might seem low, it is MORE than enough for 99.9% of vapers. 200W is excessive. Even for more exotic builds. So, while 150W would have been nice, I can’t say this is something that bothered me. Power Mode: Fast firing, no complaints in this regard. One cool thing it does is deliver the same power at low battery levels. Not sure how GeekVape does this, but it is very cool. TC Mode: I don’t really TC vape that much, but the AEGIS seemed more than competent during my tests. Nothing occurred that made me think anything was wonky in this regard. VPC Mode: Here, you can adjust the mod’s power curve over five seconds. Again, not really I feature I use. But it is easy to setup and allows for a more bespoke vaping experience if that’s your bag. Bypass Mode: This mod has A LOT of safety features, so Bypass Mode is fairly simple (and easy) to use. Make sure you’re using fresh cells, and you’re au fait with Ohm’s Law, and you’ll be sound. All told, the GeekVape AEGIS is a really solid performer. I tried to find faults with its performance, but there are very few chinks in its armor. The only REAL issue I encountered was its random shut-downs. But, again, this only happened twice – and it could just have easily been something I’d done. Bottomline: this thing is a very, very solid, all-around vape mod. It has all the modes you could want and it delivers power like a Tesla (i.e. 100% right off the bat). Again, this is a single cell mod. Even if you’re using the larger battery style, you’re still going to run into problems if you’re vaping it at maximum output all day. A dual-battery mod like the Innokin Proton Kit is always going to beat a single cell mod for high-power vaping. If you’re running a single-coil RTA or a sub-ohm tank that’s rated for around 50-60W, you’re going to get the most out of its battery. Running a dual-coil RDA at 100W, whilst chain vaping will kill the battery in no time at all. I was rocking the Kayfun Prime on mine for the majority of my testing. I run this tank around 15-20W and this ensured a solid, three day’s worth of vaping. My advice? If you get this mod, pick yourself up a single-coil RTA. 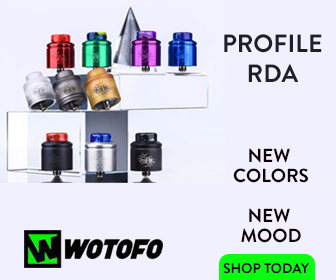 You can see all my top picks for the best single coil RTA tanks, if you need some help choosing one. Something like the Kayfun 5 (if you can stretch that far) or the Wotofo Serpent Mini RTA. 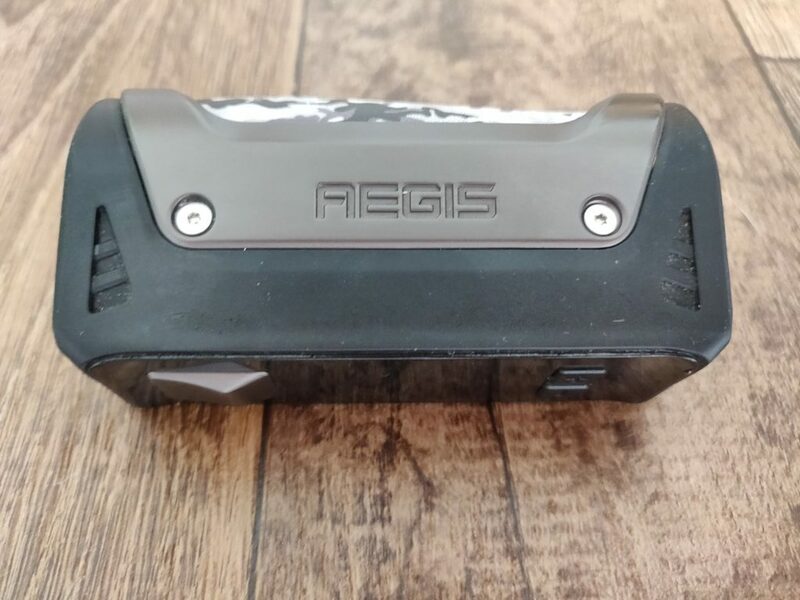 GeekVape AEGIS – Should You Buy One? Yes. 100%! This is a brilliantly executed mod that is priced very aggressively – it’s ONLY $48.95. And that is why this mod was included inside our Best Vape Mod Guide – it ticks A LOT of boxes. I’ve been using mine A LOT since I finished testing it. The mod itself, when paired with the right tank, is a truly formidable setup. You do have to run the right sort of tank on it, however, to get the most from this mod. If you’re a single coil RTA user, the AEGIS is perfect.